The Spanish American War started on April 21, 1898 — a fact you’ve probably learned in a history class. One fact you probably didn’t know: a native of Raleigh was the only U.S. Navy officer killed in action during the war. Worth Bagley was born on April 6, 1874 in Raleigh, North Carolina and at age 15 was sent to the U.S. Naval Academy at Annapolis, Maryland. Unfortunately, Bagley struggled to complete the demanding curriculum as an adolescent. The Academy forced him to leave due to various shortcomings, but Bagley returned in September of 1891 when he was 17. The second time around at the Academy, Bagley fit in easily and was an outstanding student. Soon after returning, he joined the football team and lettered in 1891, 1892, 1893, and 1894. The USS Texas, a commissioning flag at the mast, is anchored with a two and three masted ship in the background for company in 1895. 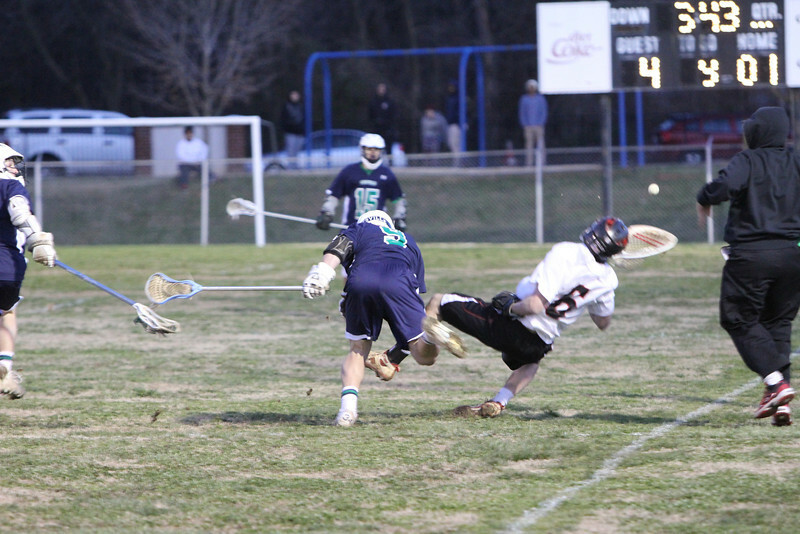 Photo courtesy of Sean Hert. After graduating from the U.S. Naval Academy in 1895, Bagley was assigned to USS Montgomery and then to the USS Texas. He was transferred yet again to the USS Maine in 1896. Luck intervened for Bagley in 1897, and he was transferred off the vessel that July– narrowly escaping the Maine’s tragic explosion, and subsequent sinkage, in Havana Harbor the following February (during the Cuban revolt against Spain). It was in this year (1897) that Worth Bagley became Ensign Worth Bagley, making him a junior ranked commissioned officer. In 1897, Bagley became the inspector for Columbia Iron Works’ new torpedo boat, the USS Winslow, in Baltimore, Maryland. When she went into commission on December 29, Bagley became her executive officer under Lieutenant John Baptiste Bernadou. 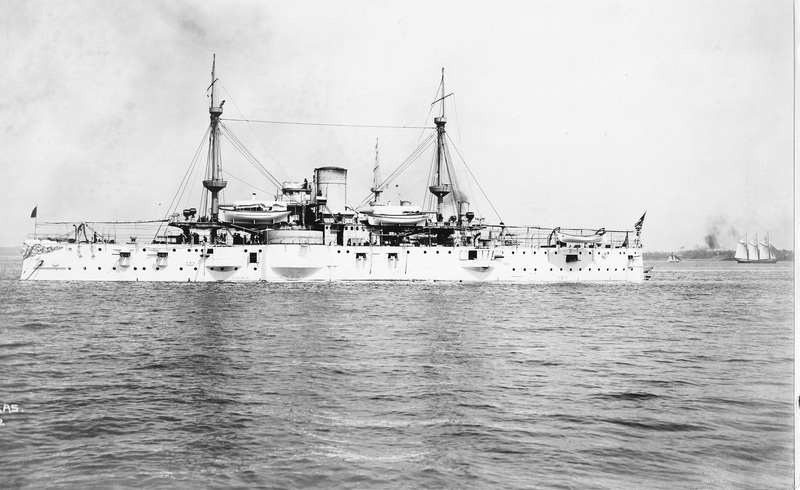 The Winslow was mobilized with the rest of the Atlantic fleet for operations in Cuban waters in April 1898, shortly after the Spanish American War began. 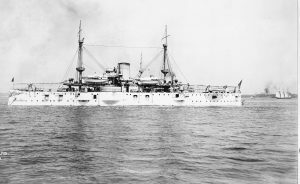 On May 11, 1898, the Winslow, USS Wilmington, and USS Hudson journeyed together to force entrance to the harbor of Cárdenas in Cuba. The Antonio López, one of several Spanish gunboats, fired upon her and an aggressive engagement commenced. 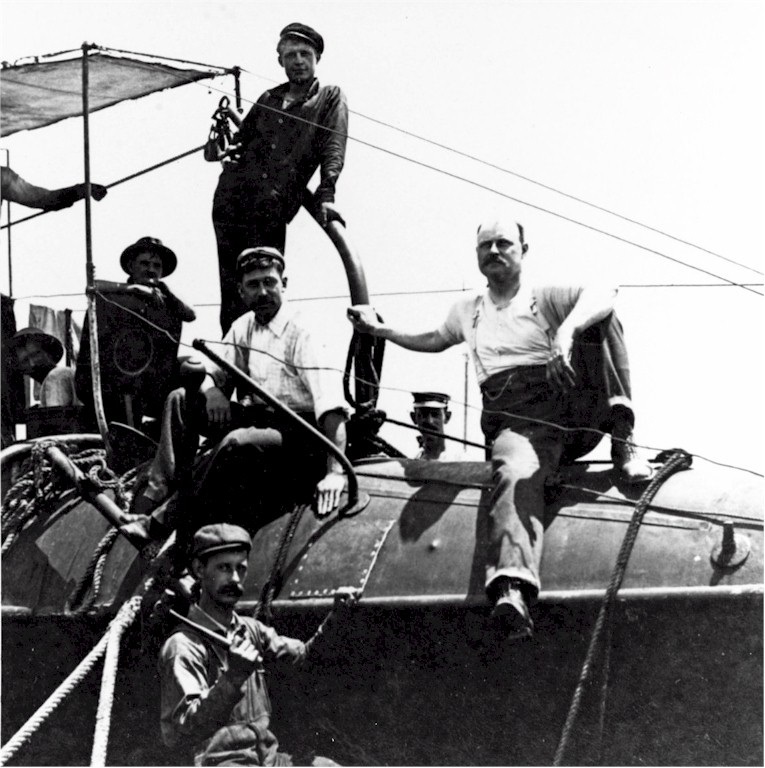 The Antonio Lopez was an ocean liner converted to a military transport vessel in 1888. 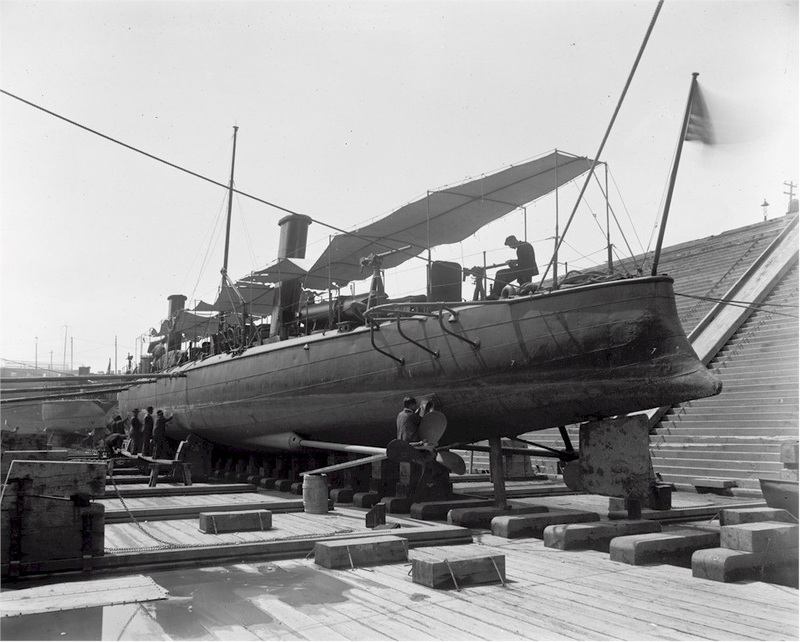 She was used as a blockade runner for Spanish troops during the Spanish American War. Photo courtesy of Nick Mitiuckov. Soon the Winslow became disabled due to a loss of steam and steering capability. Bagley then assisted in maneuvering the damaged vessel; he was alternately moving the ship forwards and backwards, keeping the vessel a moving target as he slowly backed it out of the line of fire with the single engine that was operational. Once the Winslow became close enough, the Hudson came to the rescue and hauled it fully out of range of the Spanish gunboats. However, before she was out of range, a shell struck the armored deck while Bagley was passing along it. He recited a report on the damage to Lt. Bernadou when a wave of shrapnel pummeled the deck. Bagley and four other crew members suffered extreme wounds resulting in almost instant passing. Ensign Bagley’s body was transported to Key West and then Jacksonville, Florida. Officers presented his remains to one of his brothers, William Henry Bagley. 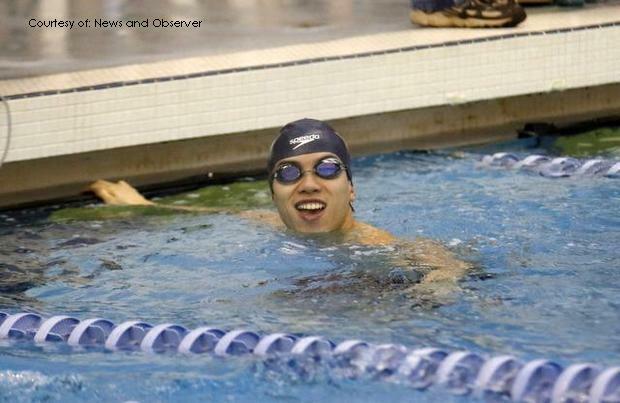 On May 16, his body arrived to his hometown of Raleigh, North Carolina where his mother still resided. The funeral for Ensign Bagley was an immensely large and honorable affair. The funeral cortege included three thousand people: fifteen hundred soldiers, twelve hundred school children, two hundred college cadets, as well as state and city officials. Since no church was vast enough for the cortege and onlookers, the service was held in the Capitol Square. On the day of he funeral, Bagley’s coffin was escorted into the Capitol rotunda by the Governor’s Guard, and allowed to lie in state. Schools and businesses closed in honor of the event and flags were placed at half-mast. Bagley was laid to rest in Oakwood Cemetery located near the North Carolina State Capitol in the city’s Historic Oakwood neighborhood. 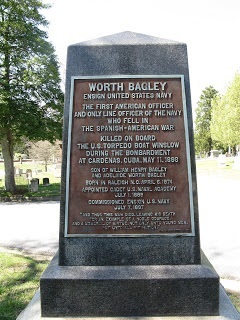 Ensign Worth Bagley passed away at age 24, leaving behind three sisters, three brothers, and a widowed mother. He proceeded his father and infant brother in death. Bagley’s gravestone contains information about his life and how he passed. Photo courtesy of Cherie Atkinson Clark. Looking back, it is unclear if Bagley was the victim of friendly fire or enemy fire– the fatal shots might have been fired from the Wilmington. 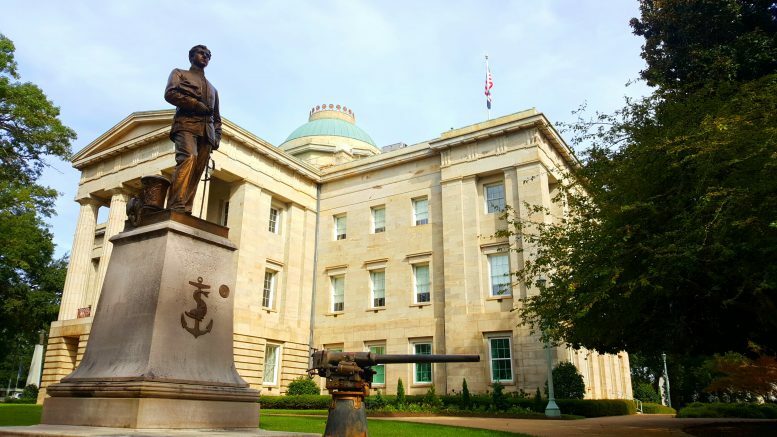 Today, Ensign Bagley is memorialized in Raleigh, North Carolina through a bronze statue of himself. The historic landmark is one of only three memorials located in front of the state Capitol building and was unveiled in 1907. The base the statue is situated on is inscribed with the words “Worth Bagley, Ensign U.S.N., First Fallen 1898” and decorated with a bronze anchor and navy department seal. The U.S. Navy has also named three vessels in his honor. All were named USS Bagley, the first was a torpedo boat built in 1900, the second a destroyer built in 1918, and the last, another destroyer built in 1937. The U.S. Naval Academy also honored him when in 1899 a tablet was laid in his honor in the chapel. Be the first to comment on "The Story of a Naval Officer"